Happy New Year! 2018 is off to a great start for our guild. 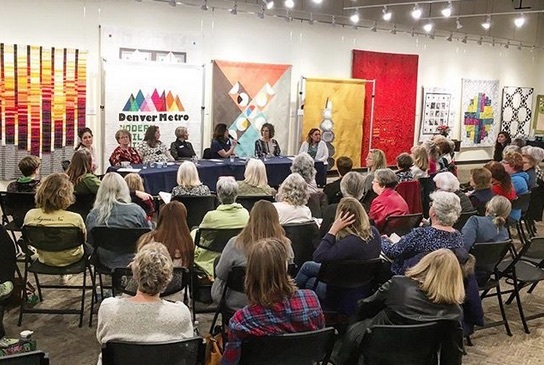 On January 20th, seven DMMQG members participated in a panel discussion about the “How New is Modern?” show at the Rocky Mountain Quilt Museum. We also met at Fancy Tiger Crafts in Denver for our first meeting of the new year, with eleven members present and two first-time visitors. Beautiful enamel DMMQG pins are available to purchase! Special meeting on Feb. 9th: Amy Friend “Trunk Show” at Colorado Fabrics!